It’s almost three months since he was shot in the back — close to his back bone — at short range — by an Israeli settlement security officer. And Nadjer Assad Nadjer is recovering slowly. We met with him, about a week ago, in his home town of ‘Urif. He was amazingly open about his situation, and in reasonable spirits given what he has been through. I share his story, because his experience is not at all unusual. It is in continuity with so many other stories I keep hearing. To say it’s been hard for Nadjer, is not just an understatement. It’s been difficult physically, and psychologically. He says it has severely strained a marriage that was just a month old when he was shot. He showed us his wounds. When he did this, I was sitting beside him, such that when he yanked-up his T-shirt, I ended up with a closer look than I needed — and this conclusion: He is very, very lucky that major organs were not hit and damaged! It all began, when settlers trespassed Palestinian land and started fires in the dry wheat and grass of the hills outside the village of ‘Urif. About 150 dunums were burned, in all. Word obviously spread, and when he heard, Nadjer acted instinctively to a call to extinguish a fire in his family field. He quickly went to the field. “My only concern was to stop the fire. I did not think about who was responsible for the fire. We were doing it by hand. Sometimes the fire brigade has trouble reaching the fields,” he recalled. Many people came out from the village. The scene escalated with the army present to defend the settlers from the Yizhar settlement near Nablus. He worked to put out the fire, until he was accused of carrying a knife. While he had no knife, or weapon of any kind, he was grabbed and handcuffed and thrown on the ground and beaten. When he tried to get up, that’s when he was shot in the back. “I could see an ambulance, but it wasn’t allowed to come near to help me. After I was shot, I thought I was going to die. But I came back to life,” said Nadjer. While the army did not intervene to protect the Palestinains, and got involved in firing tear gas, he does credit one soldier with putting a compress on his wounds. Since then, he’s had surgery, numerous trips to the hospital, and some physiotherapy. Today he cannot walk without a cane. He can’t straighten his leg, and he has constant pain. From the surgery, he now has a steel plate in his back. Prior to the attack, he worked as a labourer, with his father in a local quarry. When I left him, to return to our village, I was sad that his life will never be the same. I wished him healing and strength. I privately added him to my prayers. His exit wound is far more than physical. Sadly, the settlers who have penetrated the heart of the West Bank have found a sure fire way to alienate their Palestinian neighbours and give common folk good reason to resent their intrusion. 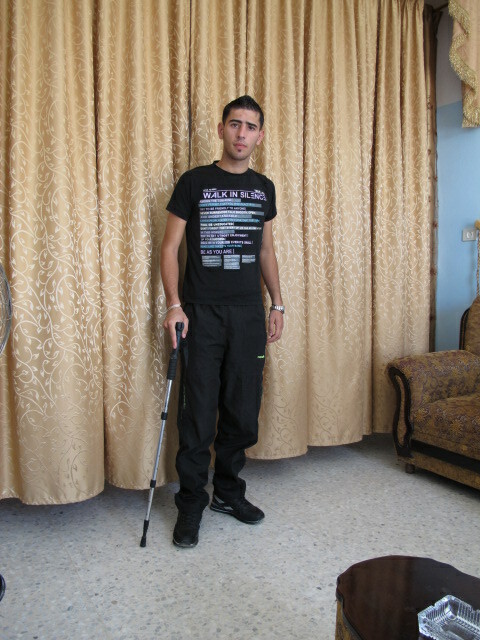 Some people, like Nadjer, will share the scars of the Occupation all their lives. I have been sent by the United Church of Canada to participate the the World Council of Churches (WCC) Ecumenical Accompaniment Programme in Palestine and Israel (EAPPI). Should you wish to re-post or publicize any of this content, I welcome your direct request, via the comments section in this blog. Thank you! Jim, when I read this story of the young Palestinian, I am immediately grabbed by how much my own young 17 year old grandson resembles him in appearance! As a grandmother, I can only imagine how I would feel if this had been my grandson. In hearing about the Pastinian youth and his family, my heart is touched indeed. Surely they must feel both angry and sad, grieving and disheartened by the injustice in the offence against him, a young person just married and looking forward to working with his father, building a home and a future for a family. I too pray for him too.